Ocean's Edge Resort & Marina is your jumping off location to catch the trolley for Discover Stock Island during the I Love Stock Island Festival. We have plenty of free parking and lots to see and check out at our beautiful resort and marina. 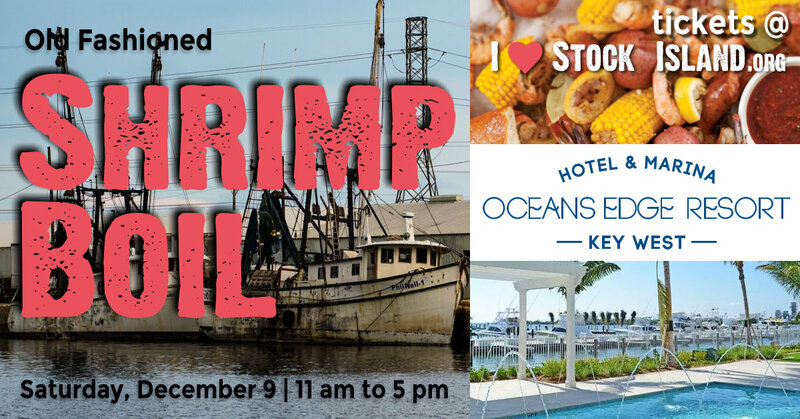 Saturday, 11 am to 4 pm we're offering an amazingly delicious and affordable old time classic shrimp boil featuring Key West Pink Shrimp fresh off the shrimp boats, smoked sausage, new potatoes and sweet corn on the cob. Kick back and enjoy the freshest seafood, panoramic waterfront views and outdoor dining from our new resort. Or enjoy our full menu of American-Caribbean Cuisine at Yellowfin Bar and Grill. If you have yet to discover the exquisite taste of the Florida Keys' legendary seafood and Caribbean-influenced cuisine, allow us to tempt your taste buds with the finest, freshest flavors in town. And don't forget a few relaxed drinks at our waterfront bar! Tickets for the shrimp boil are just $19.99. Gratuity not included. Reservations should be made in advance. Guests must present paper ticket or mobile ticket upon arrival.